Rushed for time in the mornings? These Frittata Breakfast Cups are a healthy "grab n go" options, loaded with protein and veggies to get your day started off right! One serving = 2 breakfast cups. Preheat oven to 350°F. Line muffin tin with cupcake liners for easy clean up (and transporting). In a pan, sauté bell pepper, green onion, and asparagus in a little bit of grape seed oil. Add spinach; cook until wilted. Add tomatoes and cheese. Remove from heat and scoop even amounts into the cupcake liners. Fill with egg whites, until about 2/3 - 3/4 of the way up. 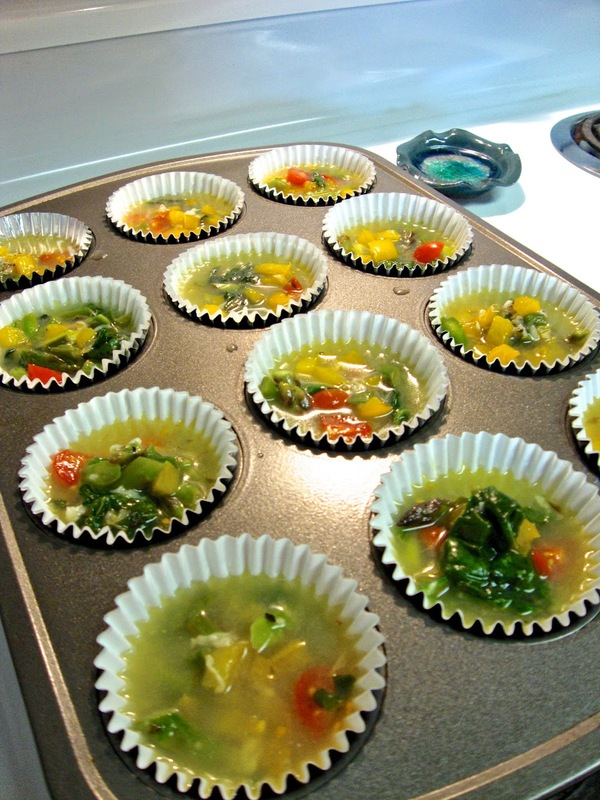 Place muffin tin in the oven and bake for 15-20 minutes or until cooked and golden. Enjoy! *NOTE: Store in an air tight container up to three days, in the refrigerator. Peel off cupcake liner and pop in the microwave for a few seconds to reheat.